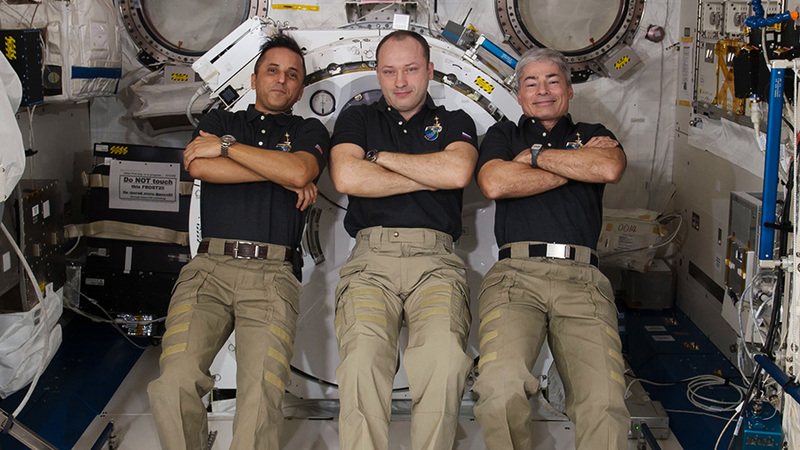 Expedition 53-54 crew members (from left) Joe Acaba, Alexander Misurkin and Mark Vande Hei pose for a portrait inside the Japanese Kibo Laboratory module. Three Expedition 54 crew members continued preparing for their return to Earth next week. A pair of astronauts also opened up BEAM today to stow a robotic hand and to check for contaminants. Commander Alexander Misurkin joined his Soyuz MS-06 crewmates Joe Acaba and Mark Vande Hei and reviewed their procedures for next week’s descent into Earth’s atmosphere. The trio also familiarized themselves with the sensations they will experience flying through the atmosphere and feeling gravity for the first time after 168 days in space. Misurkin will hand over command of the International Space Station to cosmonaut Anton Shkaplerov on Monday at 2:40 p.m. EST. Misurkin, Vande Hei and Acaba will then close the hatch to their Soyuz spacecraft Tuesday at 2:15 p.m. and undock from the Poisk module 6:08 p.m. The trio will then parachute to a landing in Kazakhstan at 9:32 p.m. NASA TV will cover all the landing activities live. Flight Engineers Scott Tingle and Norishige Kanai will stay behind on the station with Shkaplerov as commander officially becoming the Expedition 55 crew when their crew mates undock next week. They will be joined March 23 by new Expedition 55-56 crew members Oleg Artemyev, Ricky Arnold and Drew Feustel. The trio will launch March 21 and were in Red Square in Moscow today for traditional ceremonial activities. Today, Tingle and Kanai opened up the Bigelow Expandable Activity Module (BEAM) and stowed a degraded robotic hand, or Latching End Effector (LEE), that was attached to the Canadarm2. The LEE was returned inside the station after last week’s robotics maintenance spacewalk. The duo also sampled BEAM’s air and surfaces for microbes. Best of luck on your return home to Misurkin, Vande Hei and Acaba! A job well done! May the Force be with you. All the best for return journey. Have a safe journey! !